Published in the United States on May 29 as THE UNTOLD. “This extraordinary novel – propelled by the dark, rich, talents of a truly brilliant writer – dazzles, staggers and amazes.” Elizabeth Gilbert author of Eat, Pray, Love. It is 1921. In a mountain-locked valley, amid squalls of driving rain, Jessie is on the run. Born wild and brave, by 26 she has already lived life as a circus rider, horse and cattle rustler and convict. But on this fateful night she is just a woman wanting to survive though there is barely any life left in her. She mounts her horse and points it towards the highest mountain in sight. Soon bands of men will crash through the bushland desperate to claim the reward on her head. And in their wake will be two more men, one her lover, the other the law, both uncertain if they should save her or themselves. But as it has always been for Jessie, it is death, not a man, who is her closest pursuer and companion. And while all odds are stacked against her, there is one who will never give up on her – her own child, who awaits her. The Burial, both heartbreaking and exhilarating, ultimately sings out for life and then grips onto it, with tooth and broken nail. The most incredible and astounding prose I have read in a long long time. Fiction does not usually capture my interest in writings but The Burial was enthralling! Congratulations Courtney, beautifully written! I’ve just started it and it is beautifully written. I wonder were you inspired at all by, or have you read, Toni Morrison’s Beloved? Thanks Mary. And thanks for reminding me about Toni Morrison’s Beloved. I haven’t read it in about 15 years ago but it haunted me significantly at the time. So, although I wasn’t conscious of it, it was one of those head and heart shifting books. That sounds like inspiration to me! Hey Ms Collins! I just finished your book- in 2 days! Beautiful writing, I loved it. Biggest congratulations! I thought you’d love to know that I showed it to my Mum and she exclaimed that she had already read it (independently of me) and had recommended it to my Aunty and Nanna as something wonderful. She was excited that I knew you and wanted you to know that she really loved the way it was written. Can’t wait for your next one! Hi Courtney, I just finished the book – I loved it. Really well written. I couldn’t help but to think of the parallels in modern time. Women are still judged more harshly than their male counterparts. Our book club has just read your book.Although none of us actually like the book it created a great amount of discussion,much more than some books we all liked.We were wondering what motivated the telling of the story through the dead babie’s eyes? This aspect disturbed some of our members. Thanks for getting in touch. And thanks for your frankness! In an attempt to answer your question, I had a strong sense that the voice of the book had to be ‘from the earth’. Jessie’s story is one of those buried stories after all. To me, Jessie was a woman of few words. She was a woman of action. So her voice was limiting. I began to think of the dead baby as all of that innocence that Jessie had to burry in herself in order to survive. I see the baby and its consciousness as very much a part of her. Thanks for giving time to The Burial. I’m happy to hear that it generated a great amount of discussion. Cheryl from the Syd 4 SSE group and I have just finished your book in record time. It was an absolutely brilliant read, thoroughly compelling, dark and disturbing and so beautifully written, with characters that I really felt did not want to say goodbye to at the end. 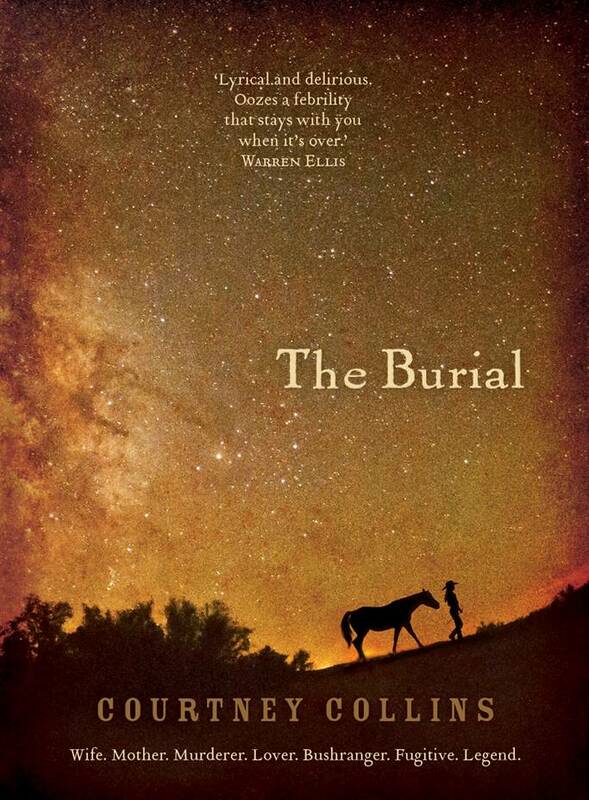 Our book club is reading The Burial now on my recommendation and I can’t wait to have the discussion with them. I will be eagerly await your next book and congratulations on such a successful first novel. I’m trying to send it to my sister for her birthday- but I can’t. Allen and Unwin says problem with distribution and can’t even take my order! Is this because it’s wildly successful and is being reprinted? How can I get it? I’m sorry you’re finding it tricky to get your hands on the book. Yes, hopefully it means that all of the books are now in the shops or even better, in readers’ hands! I know both have The Burial in stock. I do hope it gets to your sister for her birthday! all the best for your writing and congrats on the Stella shortlist. Thanks for your lovely message. I’m so pleased that The Burial took you on this ride and I’m chuffed that it reminded you of the writing of the wonderful Sonya Hartnett. I’m in the middle of packing to head to Sydney tomorrow for a week at the Sydney Writers’ Festival. If you are close to Sydney, come along. There’s a couple of events where I’ll be talking about the writing of The Burial and also my new novel, The Walkman Mix, which is a work in progress. This link should take you to the list of events. All the very best to you, Sarah. Just loved it! A female Heroine! I have just finished the book and felt the need to say how much I thoroughly enjoyed the book! Well done Courtney!! It is our book for the month for book club and I now need to get my thoughts together on discussing it. So excited to discuss this story. I live in the Hunter and imagined the story being set around the Barrington Tops or the Broke Ranges or the like. I so hope Jack and Jessie a future together!! Read some great reviews and now really looking forward to Reading the book. Courtney, thanks for a great read, a very vivid world that I was sad to leave. Looking forward to your next book. 10 to 15 minutes is no time at all really. Sometimes you might need to wait for hours. But just keep breathing and keep the pen in your hand and something will happen. I am a writer, and a student of writing, so these days I don’t have much time to read. If all that is said about your novel is the least bit true I will take the time. Tell me is it available as an E-BOOK or can I buy it in an Adelaide bookshop. blessyou Raymond. You can indeed buy the book on Amazon for Kindle. I loved the raw quality of this book – it just raced along and I lived and breathed it. I’ve misunderstood something though I think – please could you tell me the identity of the body in the legiron on page 2? In ‘Prelude to Death’ Houdini has disturbed the body of Septimus, Jessie’s father, from his watery grave. You might remember Aoife, Jessie’s mother, tips him into the river? She has attached a leg iron to his ankle to make sure his body will sink. And it did. So many lives overlap in the telling, and bodies too! Thanks so much for this. I’ll re-read now – and get much more I think! I’m reading your book in Paris, France. Your words are travelling fast and strong. They will be with me for a long time. Thank you. Thank you for getting in touch. Unfortunately, I can’t read French but I am told the translation done by Erika Abrams is really something special. So the book you have in your hands exists in large part because of her sensitivity to the language and the landscape of the place. I hope the words carry you through. I’m reading an advanced version of the Spanish translation of your book, as an assignement of my “Editing and publishing course” teacher. While still cannot say I liked a lot the novel (I barely read 60 pages), I must say that so far I’ve found it quite strong and disturbing. Somehow made me recall “El llano en llamas” stories by Juan Rulfo for its oppressive atmosphere and some of the early Yu Hua’s stories for its cold and violent touch. I’m sure I’ll like it a lot once I’ve finished it. Finished it. I’d liked it a lot. Congratulations!! Thanks Jordi Sellarès. I was holding my breath. The words leap from the pages as though they have an existential voice that found paper suitable for binding to the material world..this is a book from heart, mind and soul and I am so glad to have found your voice, as will others. You are a beam of light by which you brought forth not just the story that needed to be told but the story that lives in the bones of our female ancestors and speaks to the world down under. To the dirt that forms Gaia and the wild woman whom we always need a reminder to connect to. The place where we can howl and only be heard by all sentient beings. Thank you for sharing your wild and spirited self through beautiful prose. As the grand-daughter of Jessie Hickman I cannot let this go by without adding my protest.. The Burial is a travesty of my grandmother, making her out to be a bloodthirsty murderer of her own child. In fact, Jessie was born to poverty,given to a circus aged eight and had to fend for herself from there on. She grew up to be an independent, courageous woman, perhaps even one of the earlier seekers for equality for women. Yes, she chose to be an outlaw, cattle duffer, horse thief but murderer… never! My family and I are highly offended by the misinformation and calumny.which has been directed at the character in The Burial specifically identified as Jessie Hickman. For anyone seeking the real Jessie Hickman read “Out of the Mists, The Hidden History of Elizabeth Jessie Hickman” I suggest that a pubaalic apology for the distress caused this family would only be a courtesy..
I’m afraid your reading of the character of Jessie as a bloodthirsty murderer is not what I intended at all. But that is your reading. For me, Jessie’s act of killing her premature child is an act of compassion. It is also worth restating that the book is a work of fiction. My view is that there is room for more than one telling of a historical (and now mythologised) figure and fiction can go places non fiction can’t. So I wish you all the best in finding an audience for your book “Out of the Mists, The Hidden History of Elizabeth Jessie Hickman”. Courtney I want thank you for putting a fine piece of work out there. The writing and the tale work so well together. Thanks. Dear Ms. Collins – for your work Untold, humble thanks. Profound and shocking to the core. I wept on page 12. “forward and back I have tracked her.” Then regularly thereafter, though I am not the weeping type. Every sentence finds its mark. I wonder -has practice given you the ability to write this raw and heightened prose without falling into bed exhausted each night? Remarkable. Beautiful. And most of all, moving: I want to stand atop that mountain and howl to the gods. Just howl. As there is nothing else to be done. You have said it and said it well. I love the title Untold and wonder how it is to be construed as American. “The Untold” is a wonderful piece of historical fiction filled with dialogue that speaks from the heart. The scene of Barlow and Jack Brown shooting up completely surprised me. You almost feel the drug go into your veins..The description may be one of the most vivid and mesmerizing images I have ever read. Thanks again for this great read. 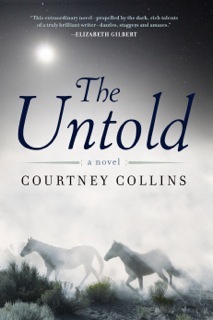 Courtney, I loved your book “The Untold” US release. When you write a fictional account o a factual legend you get a lot of comments from informed historians? I like fiction write us another story. You have the talent I have the desire to read. Found this book by accident. Loved every word every phrase and character. Told through her deceased baby is so fantastic it leaves you tingling. Didn’t want it to end. Would make a tremendous movie. Thank you for such a unique read. I thought the description of you as a “female Carmack McCarthy” was giving you short shrift even before I read the book, even more so after I read it. I think you are the female Courtney Collins! Good job on the story, I could never shake the feeling of trepidation for Jessie’s outcome and was sad when she teamed up with the boys in the mountain as I knew it could not last. They had too good of a thing going there. Again, good job, great read. I look forward to the next one. Written a book? Launch it!